And another year is nearly completed. Today I received, chose, completed and returned my Heritage Seed Library catalogue and order form. As usual the selection came down to picking through the back stories and trying to establish which were most plausible but I was pleased to find a French bean with connections to Caen (so local to us) and another which will be good for Caribbean cookery. On a housekeeping note, I've closed the Stripey Cat food blog, ostensibly so I can organise the recipes into book form but more accurately because I've become very depressed and disheartened with life and couldn't find enough cheerful things to write about. Even so, from time to time I still have small cooking successes I'd like to share so they're going to be appearing here when they happen. I have a new sourdough baby and together we're revisiting the skills needed for bread making. 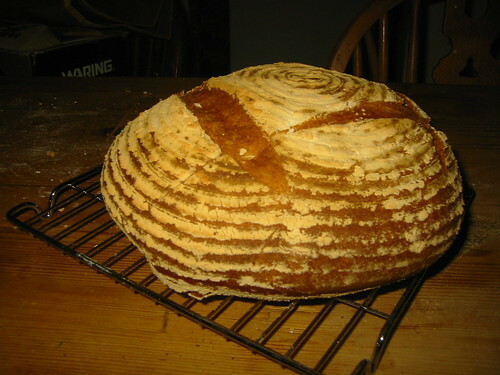 The loaf above is one of the first successful constructions to have come from this and I hope, with a little more experimentation, to have a foolproof base recipe that will happily take additions and variations in the near future. There are also some pictures to come from my only pop-up restaurant date this year but I have to talk Paul into downloading them from his camera before I can see if they're worth publishing. Hope to be back with them soon!